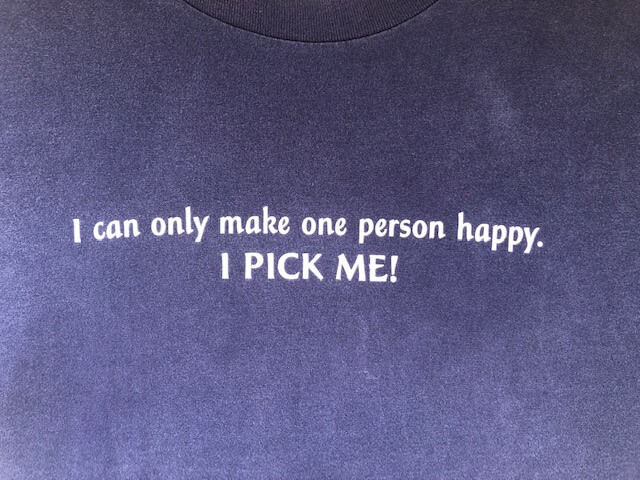 One of my children gave me a T-shirt with this slogan on the front: “I can only make one person happy; I pick me.” I suppose my child was trying to send a message, not only to me, but perhaps a warning to others who may have to deal with me. So that you don’t misinterpret what I’m saying, let me clarify. I like my T-shirt and I wear it a lot. But I don’t wear it because I want to send a negative message. On the contrary, I want to send a positive message. I have come to realize that what my new T-shirt says is exactly correct. While I can attempt to influence others, I simply cannot make someone else happy. There is only one person I can make happy and that person is me. The same is true for each of us. I can’t pick you. You have to pick you. Have you ever heard someone say “He made me so angry” or “That situation made me so mad?” While this is a common form of speech today, it simply is not so. When we face difficulties, or when we interact with others who do not share our views, we sometimes choose to be angry or unhappy. I have made that choice before. But with that choice come consequences. When we choose to be angry, we choose to be miserable, and, in most cases, make other people miserable with us. Let me illustrate this point with a real-life example. I once spent a couple of weeks traveling and working in Los Angeles where the weather, the traffic, and the mudslides had triggered the anger of millions of people. As I attempted to return home from the LAX airport, there was a man standing in line at the airline ticket counter in front of me who was mean and nasty to the airline agent because he had missed his flight. He became so hostile that they called the Police and he was arrested! I, too, had spent the entire day at the mercy of the weather and traffic, but I chose to shower down kindness, happiness, and gratitude on the worker when it was my turn. The airline agent did not choose the weather, he did not choose the heavy traffic, and he did not choose my reaction to it. Only I could make that choice. I don’t know if my kindness had any impact on the worker, but I do know that it had an impact on me. I chose to be happy. I picked me. While we both faced the same set of circumstances, the man in line ahead of me chose to be angry, and was on his way to jail. I chose to be happy, and was on my way home. So many people, today, choose to be a victim for a variety of reasons, real, or imagined. This leads to anger, hostility, and unhappiness. Life is short, and there is no guarantee of tomorrow. Let us choose to be happy, to be grateful, and to be kind to one another. I choose to be happy. I pick me. What will you choose? Thank you for all your wise and helpful messages!! So wonderful!! I attended a workshop of yours once and also read “The Heroes Choice”! Very great! Thank you for including me on your email list! Hope your health is greatly improved!! So nice to hear from you…and your “spot-on” message.